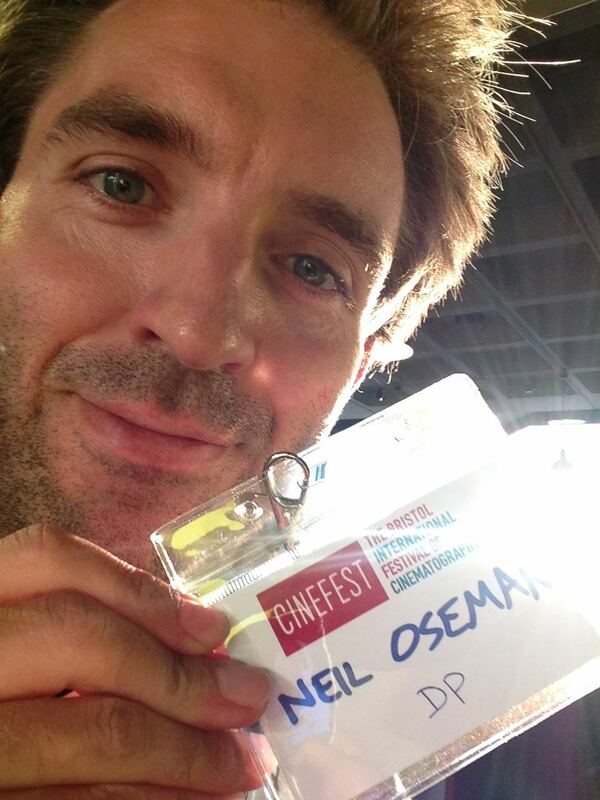 Last week I was fortunate enough to attend the Bristol International Festival of Cinematography: five days of masterclasses and panel discussions with a range of DPs from Oscar-winners like Chris Menges, ASC, BSC and Billy Williams, BSC, OBE to emerging cinematographers like Rina Yang. It was fascinating to watch the likes of Williams lighting the purpose-built set and explaining his decisions as he went. I learnt a huge amount, so I decided to share some of the opinions and nuggets of wisdom I collected. Everyone agrees that the role of the DP is being diminished. 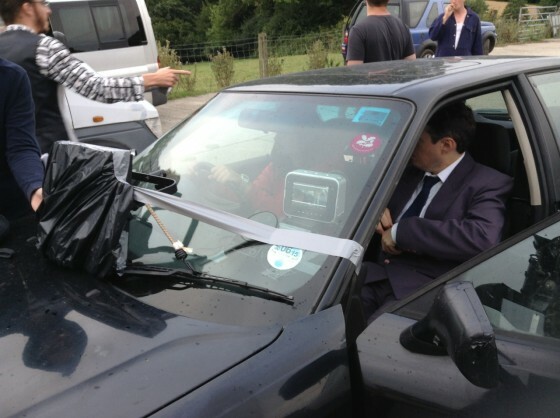 Films are more collaborative than they used to be, often with lots of input from the VFX team right from the start. Director Philippa Lowthorpe and Gray, her DP, spent weeks of prep getting on the same page when they worked together – chatting, exchanging photos, films, and so on. On Gandhi, co-cinematographer Billy Williams, BSC, OBE was granted only half of the lighting kit he asked for. That was a $22 million movie which won eight Oscars! 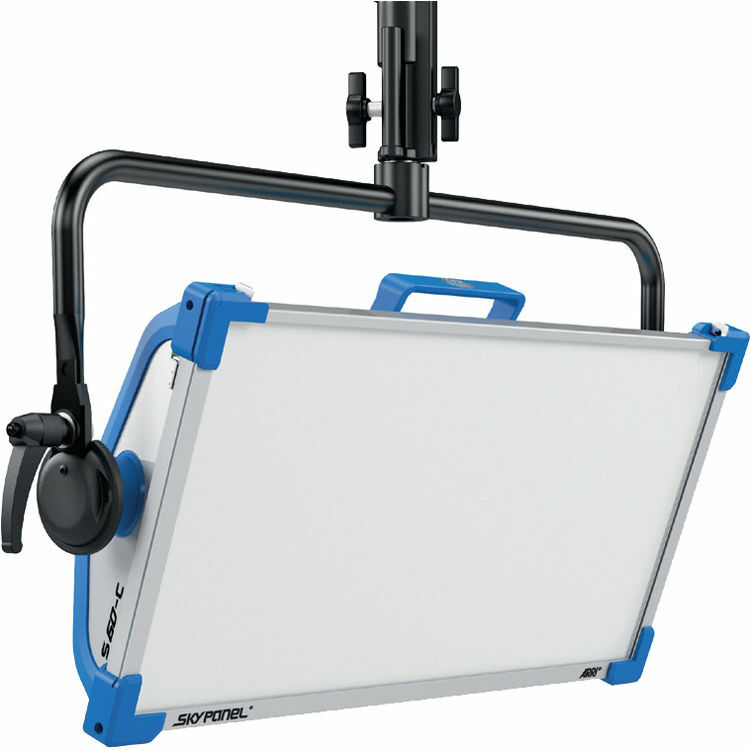 Schaefer usually carries a 24’x30′ mirror in his kit, in case he needs to get an angle from somewhere where the camera won’t fit. 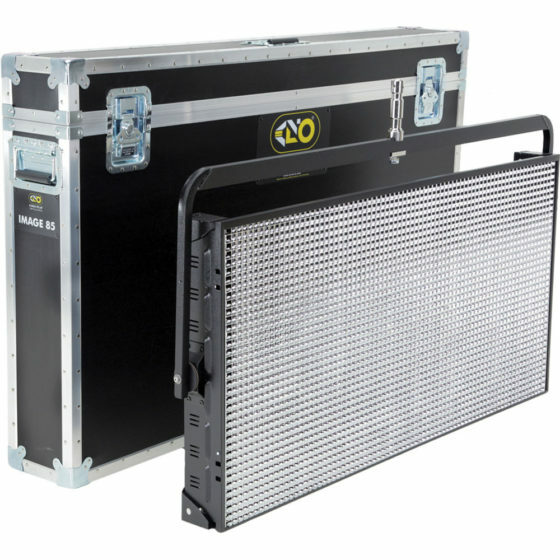 Schaefer doesn’t used OLED monitors to light from, because the blacks are richer than they will ever be seen by an audience on any other device, including in a cinema. He won’t judge the lighting by the EVF either, only a monitor calibrated by the DIT. Focus drop-off is faster on digital than on film. 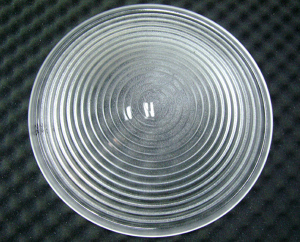 Hence the current popularity of Cooke lenses, which soften the drop-off. Nic Knowland, BSC uses a DSLR as a viewfinder to pick his shots. He also likes to record takes on his Convergent monitor so he can review them quickly for lighting issues. Director Philippa Lowthorpe prefers a DP who operates because there is no filter between the ideas you’ve discussed in prep and the operation of the camera. 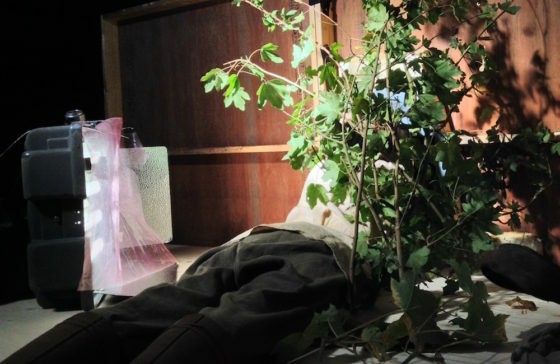 Williams advocates maintaining the same stop throughout a scene, because your eye gets used to judging that exposure. Knowland relies more on false colours on his monitor than on his light meter. Schaefer often foregoes his traditional light and colour meters for an iPad app called Cine Meter III. Knowland will go to 359º on the shutter if he’s struggling for light. 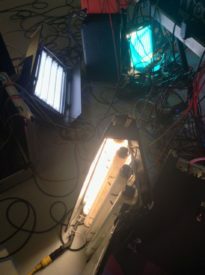 Unusually being used as practicals, in a music promo, are a 2’x4 Kino Flo (foreground, with 3200K tubes) and a Kino Flo Diva-Lite (top left, with 5500K tubes). 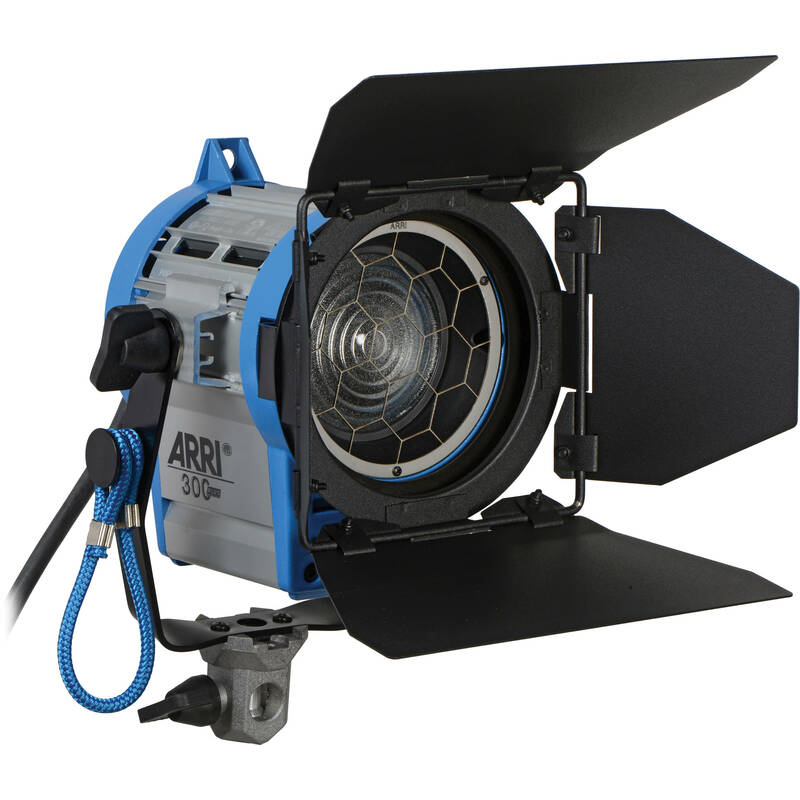 Tungsten and/or HMI lamps are usually the workhorse units of a lighting package, providing the power that is needed to key-light all but the smallest of set-ups. But they’re not right for every situation. 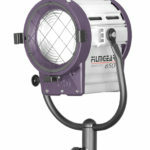 If you don’t need the punch of a point source, and you want something a little softer, fluorescents might be the answer. This is the third category of lighting units I’m covering in my Know Your Lights series; back up to the overview if you want to start from the beginning. Fluorescent units use very similar technology to HMIs, with electrodes exciting a gas so that it gives off UV light. 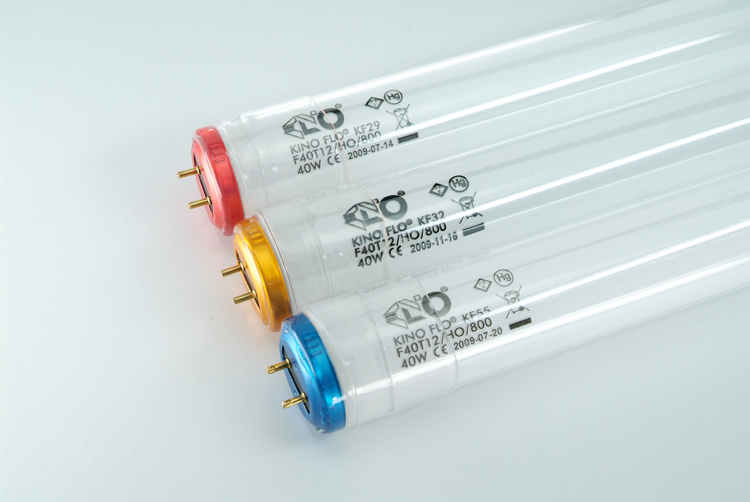 The phosphor coating on the tube absorbs the UV light and fluoresces, i.e. re-emits the light in the visible spectrum. 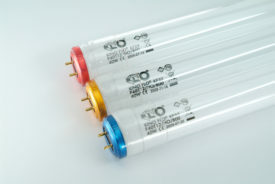 Like HMIs, fluorescent units require a ballast to regulate the current. One of the most notable early uses of fluorescents was in Robocop (1987). Jost Vocano, ASC chose the fixtures because the long, thin reflections looked great on Robocop’s suit. The flip side of that coin is that under certain circumstances fluorescents can make actors’ skin unpleasantly shiny. There was a scene in Ren: The Girl with the Mark where the poor make-up artist had to cake layers of powder onto Sophie Skelton to combat the shine of a Kino Flo I had set up. 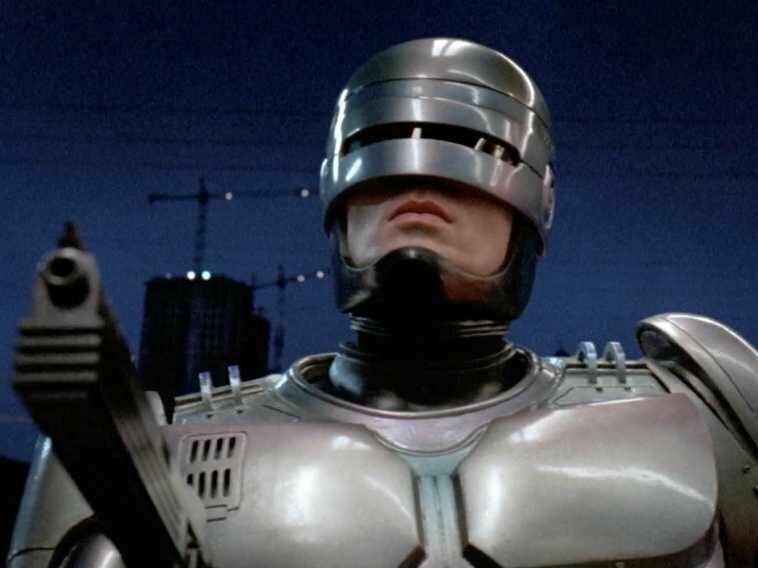 Robocop (1987, dir. Paul Verhoeven) – note the fluorescent strips reflected in the suit. 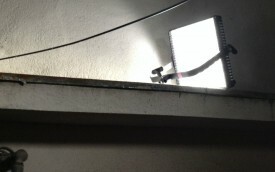 One way I often use fluorescents is as a “Window Wrap”, a soft source that augments a hard HMI coming in through a window to wrap the light more pleasingly around the talent’s face. Or I’ll place a fluorescent outside the room, to represent or enhance indirect daylight spilling through a doorway. Being soft sources, the light rays which fluorescents emit spread out widely, meaning the intensity drops off quickly as you move away from the lamp. (We refer to this as “throw”: fluorescents have little throw, whereas spotlights have a lot of throw.) For this reason they start to become pretty ineffective once you get more than about 6ft away from them, depending on the model. 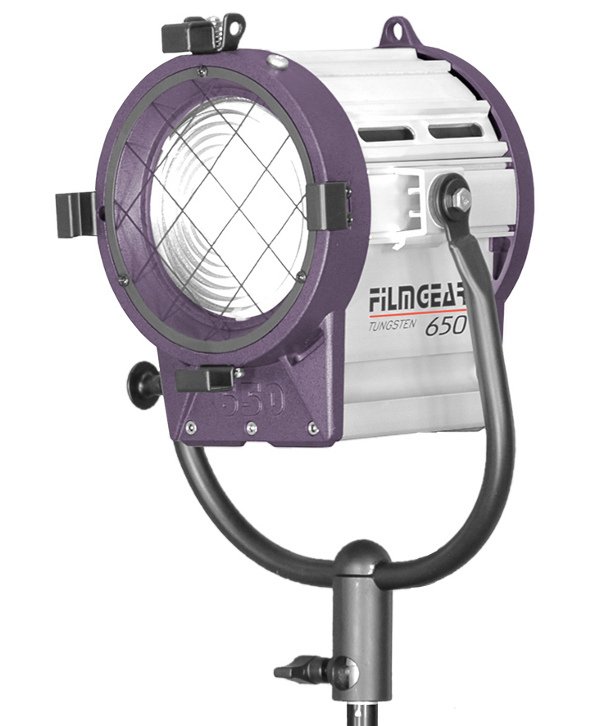 Kino Flo is far and away the most common brand of fluorescent lighting used in the film and TV industry today, so apologies if the rest of this post reads a little like an advert for them. They’re not paying me, honestly! The company was started by gaffer Frieder Hochheim and best boy Gary Swink after inventing the units for the 1987 comedy-drama Barfly (DP: Robby Müller, BVK). 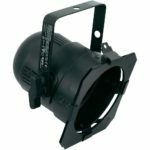 They required a fixture small enough to tuck into little alcoves in a bar location, without getting hot and causing damage. 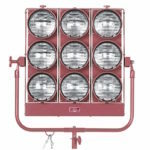 With these units, the lighting fixture is separate to the ballast, and they are connected by a header cable, just like HMIs. 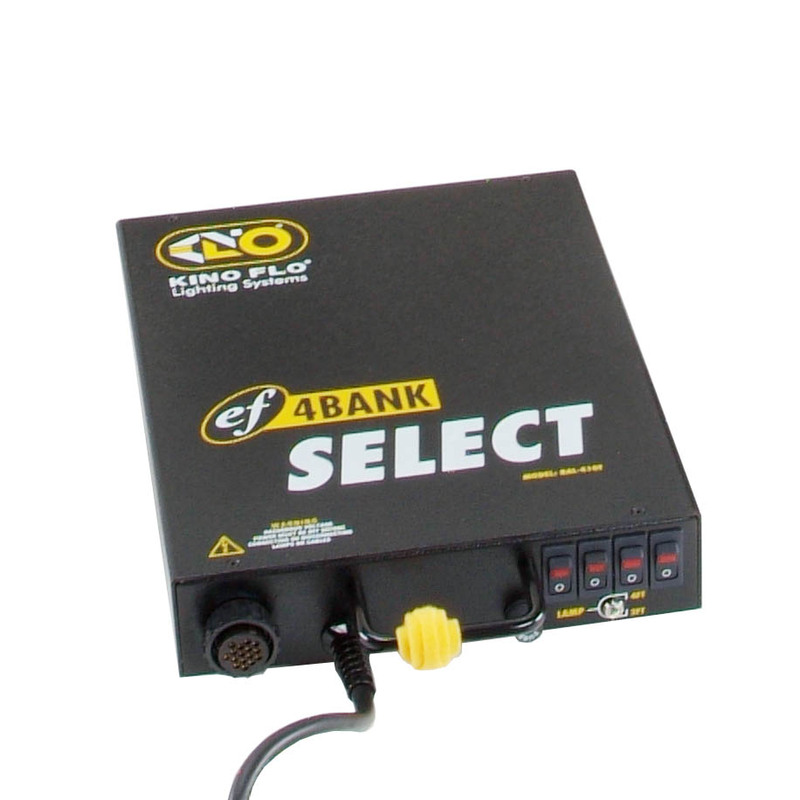 Remote units are usually referred to by two numbers, the first representing the length of the tubes in feet, and the second representing the number of tubes. So a unit with two tubes, four feet in length, is called a “4ft 2-bank”, often written as: 4’x2 (pronounced “four by two”). The most common units are 2’x4 (a.k.a. “fat boy”), 4’x4 and 4’x2, but others are available, including “Single Flo” units and 6ft/8ft “Mega” units. 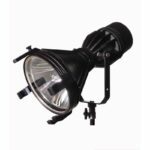 The ballasts allow you to turn individual tubes on and off as required, and also feature a switch marked either Hi/Lo or 4ft/2ft, which reduces the light output by adjusting the current waveform. Kino Flo Tegra. 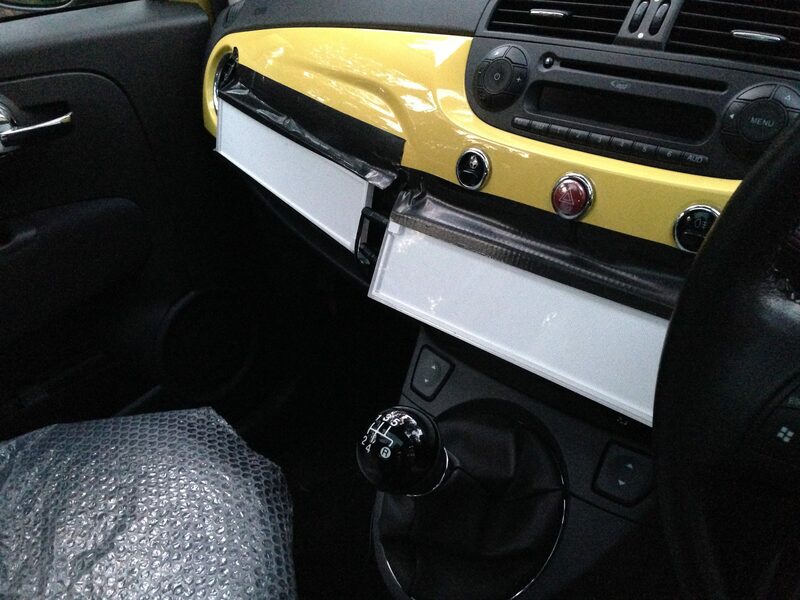 You can see the integrated ballast on the back. As you might expected, these models combine the fixture and ballast into a single unit. 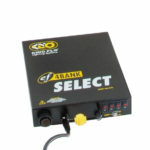 They are designed primarily for interview/ENG applications where it is more convenient to have everything in one. 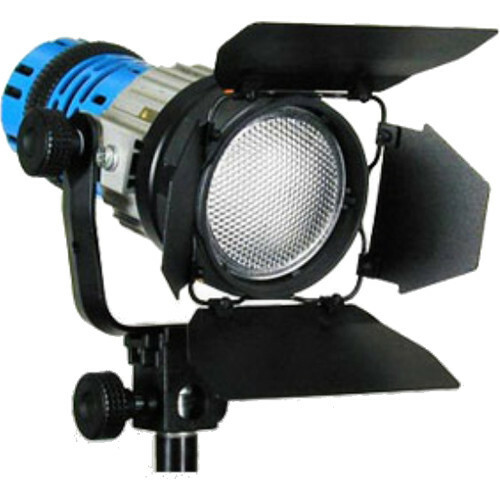 On drama productions it is generally preferable to have a remote fixture, which will be lighter, and a header cable running to an easily accessible ballast. One advantage of built-in models over their remote cousins is that they are smoothly dimmable down to 5%. Built-in units are known by names rather than numbers: “Diva-Lite” (2’x4), “Tegra” (4’x4) and “BarFly”, which resembles a swollen 1’x1′ LED panel. There is also the large “Image 87”, a 4’x8 fixture with a built-in ballast. 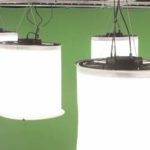 It’s great for lighting green and blue screens because it puts out so much soft light. Kino Flos often come with plastic grids known as “egg crates” or “louvres”. 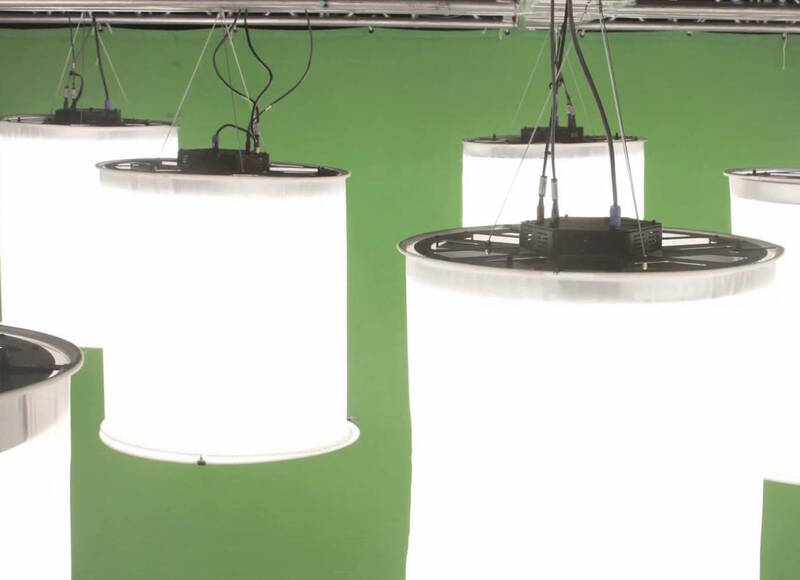 Their purpose is to make the light more directional, effectively polarising it on a macro scale. 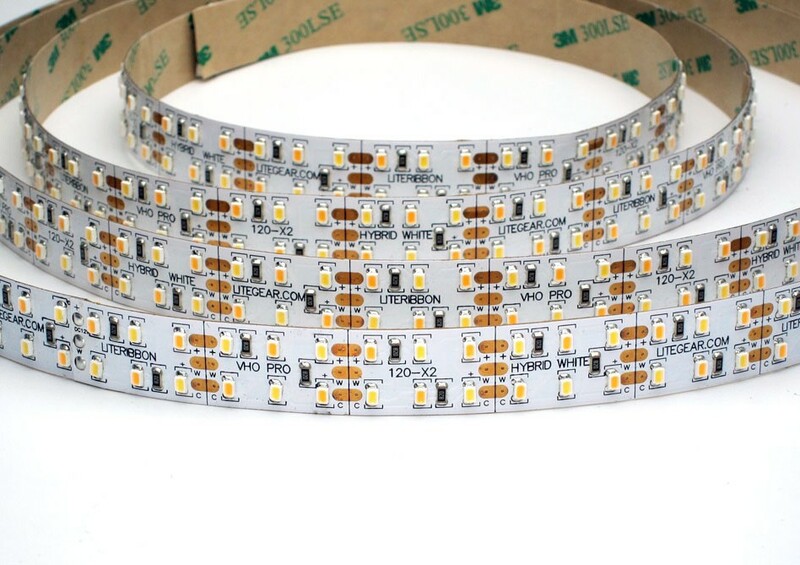 They come in black, silver and “honeycomb” varieties, the latter available in 45º, 60º and 90º angles so you can choose how directional the light becomes – and, as a side effect, how much intensity you lose. It is possible to remove the tubes and wiring from a Kino Flo housing so that the lamps can be squeezed into a tight space. For example, on The Little Mermaid we needed to see a soft blue glow emanating from a small translucent compartment in an organ. 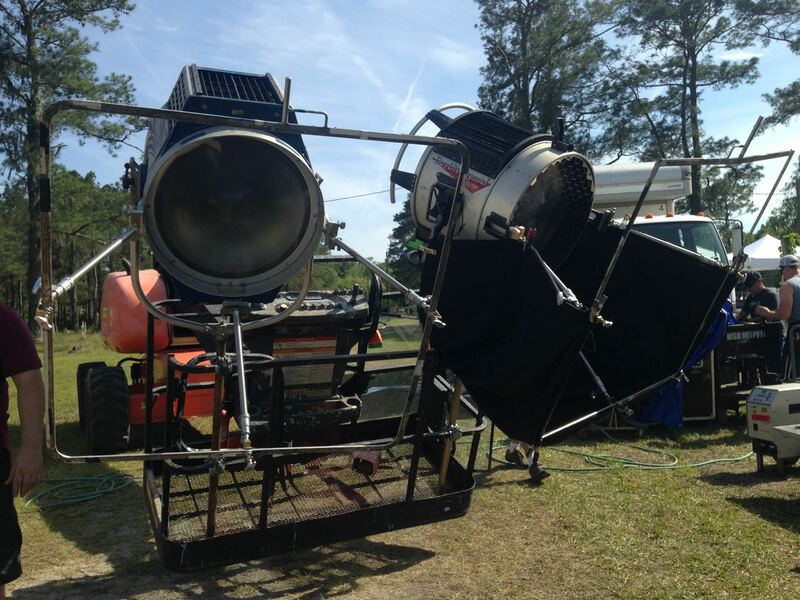 Best boy “Captain” Dan Xeller removed a 2ft Kino tube from its housing and placed it inside the compartment, running the wires out the back to the ballast. 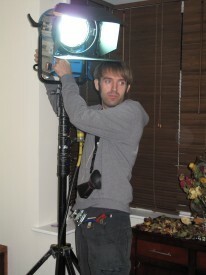 Pampa Light in action behind the scenes of Ren: The Girl with the Mark. You can see I’ve gelled it with Quarter Minus Green in an attempt to correct the CRI. Other than Kino Flo, another brand of fluorescent lights you may come across is Pampa Lights. 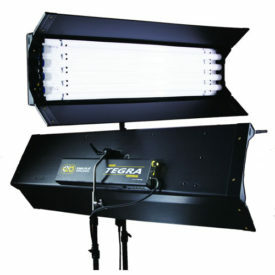 They come in rugged boxes which can be interlinked to create larger banks of illumination. Unfortunately, in my experience the CRI (see overview) is not good, and they are best avoided. The same goes even more so for the many fluorescent softbox kits available on Ebay from Hong Kong sellers. Not only are they flimsy in construction and questionable in terms of electrical safety, but the CRI of the lamps is very, very poor. 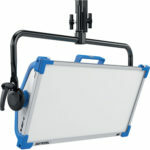 If you need a cheap soft source, you would be much better off bouncing a halogen work light off a white card. Indeed, firing an incandescent source into a bounce board will give you a better quality of light than even a Kino Flo. 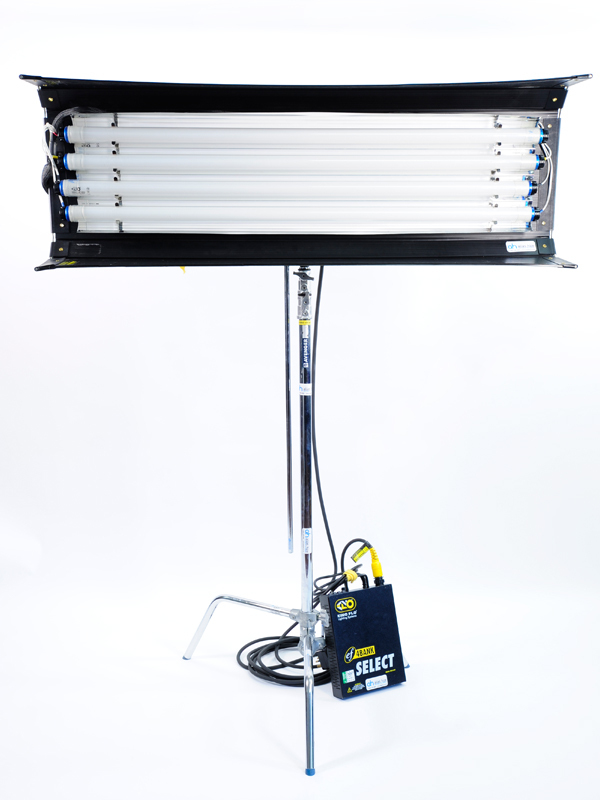 But a fluorescent fixture won’t make the room unbearably warm, it can emit daylight-balanced light, and it’s quicker to set up than a bounce board and the attendant flags. In a nutshell, it’s more convenient. 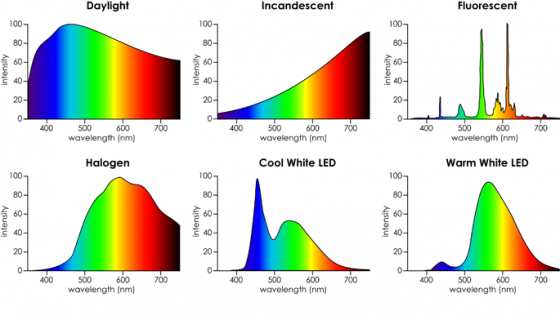 Next week, the Know Your Lights series concludes with a look at the fast-evolving world of LED illumination. 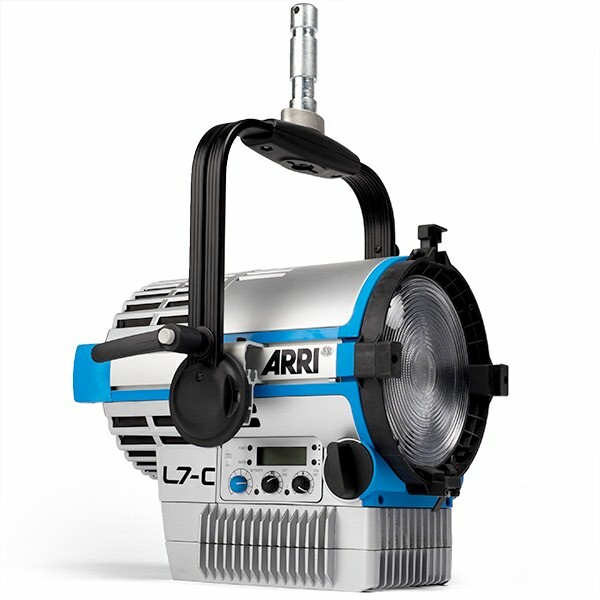 Following on from my ‘Know Your Lights’ overview last week, today I’ll look in more detail at the first category of lamps and the various units available and when you might use them. And that first category is incandescent lighting, commonly known as tungsten. 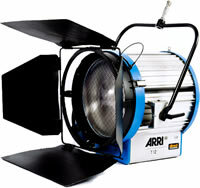 It is the oldest, simplest and most robust lighting technology. 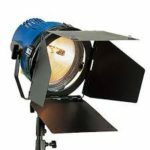 Tungsten lamps are the cheapest to hire, the easiest to repair, and emit a smoother spectrum of light than any other artificial sources, making for the most natural skin tones. For my money, there’s no better way to artificially light a human face than by bouncing a tungsten source off polyboard. This comparison of domestic bulbs against daylight shows the spectra of light they emit, with incandescent (tungsten) and halogen producing the smoothest spectra of the artificial sources. 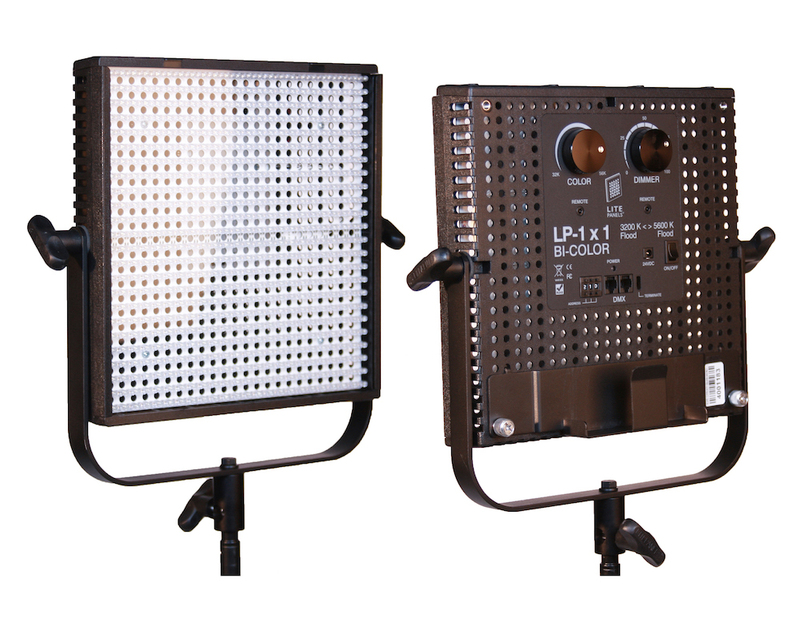 The simplest instruments are known as ‘open-face’ because they have no lens to focus the light. By far the most common units are the 800 Watt and 2,000 Watt models. These are often referred to as ‘redheads’ and ‘blondes’ respectively, though I strongly discourage these terms for reasons touched on here. 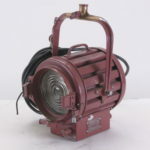 300W models – dubbed ‘Lilliputs’ by manufacturer Ianiro – are also available, as well as 1Ks and much larger models like the Mole-Richardson Skypan 5K and Skylite 10K. 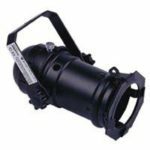 While I have lit entire no-budget features with just open-face lights, on larger productions the uneven and unfocused nature of their light makes them a poor relation of other units on the truck. They are most likely to get fired into a bounce board or used to create a little pool of light somewhere in the deep background where finesse is not needed. The fresnel lens was invented in the early 19th century by French physicist and engineer Augustin-Jean Fresnel in order to increase the focus and throw of lighthouse lamps. Today in the film industry, fresnel lenses can be found on tungsten, HMI and even LED fixtures. 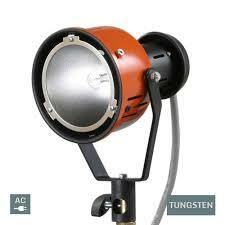 Tungsten fresnels come in the following wattages: 150W, 300W, 650W (a.k.a. ‘tweenie’), 1K, 2K, 5K, 10K, 12K, 20K, 24K. 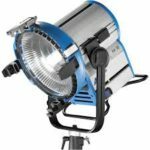 1Ks and 2Ks are sometimes called ‘babies’ and ‘juniors’ respectively, but confusingly those terms can also refer to whether they are the smaller location models or larger studio versions of the same wattage. 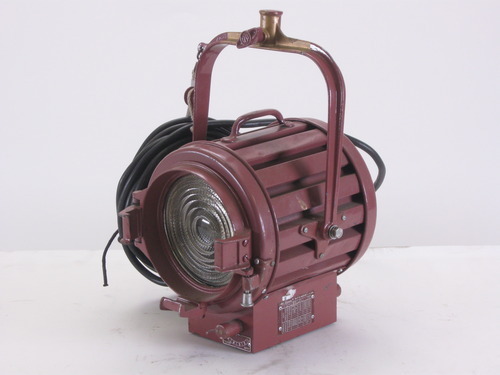 Though the fresnel lens reduces the light output a little, the beam is much more focused and can therefore create a shaft of light through smoke, which open-face lamps cannot. 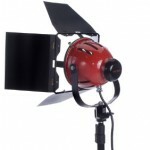 Hence I sometimes use tungsten fresnels to simulate hard sunlight when shooting on a stage. But beware that shadows cast by a fresnel can sometimes show up the ridges in the lens. I often fire fresnels into bounce boards, and because their light is more focused they require less flagging to control the spill than open-face units. On Heretiks we used numerous 300W and 650W fresnels to beef up candlelight, often placing tough-spun diffuser over them, dimming them down to warm up the colour temperature, and flickering them too. 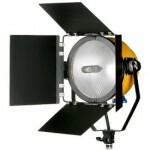 Par lights use a parabolic (shaped like half a rugby ball) reflector and a lens to produce a soft-edged oval pool of light. They are extremely common in theatres, but are often used in film and TV as well. 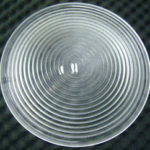 Unlike fresnel and open-face units, par cans are referred to not by wattage but by the diameter of the bubble in eighths of an inch. So a Par 16 (a.k.a. ‘birdie’) has a 2″ bulb. 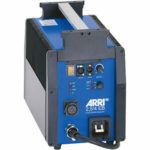 Par cans come in the following sizes: 16, 20, 36, 38, 46, 56, 64. They also come with various internal specs which affect the width of the beam. 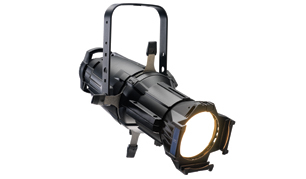 Par cans are good for throwing shafts of light. On The Little Mermaid I used them to simulate car headlights, and as practicals (i.e. they were seen on camera) to uplight banners at the circus. Maxibrutes (a.k.a. 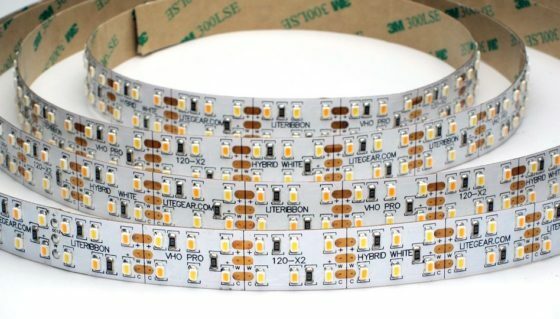 ‘Molepars’) are banks of multiple par 64 (1KW) lights. They come in banks of 4, 6, 9, 12 or 24. They pop up in the background of music promos quite often, because they look cool and kind of retro. 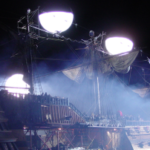 I used two 9-light Maxibrutes, bounced off the tent roof, to illuminate the big top in The Little Mermaid. 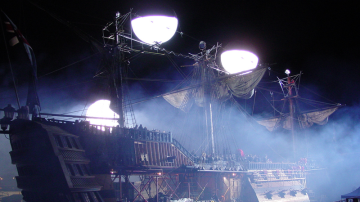 Some DPs like to use Maxibrutes for backlight on night exteriors. If you’re using them direct, you’ll need at least a sheet of diff to prevent multiple shadows. Minibrutes (a.k.a. 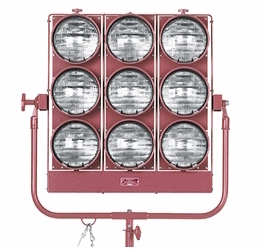 ‘fays’) are similar, but use smaller par 36 (650W) lamps. 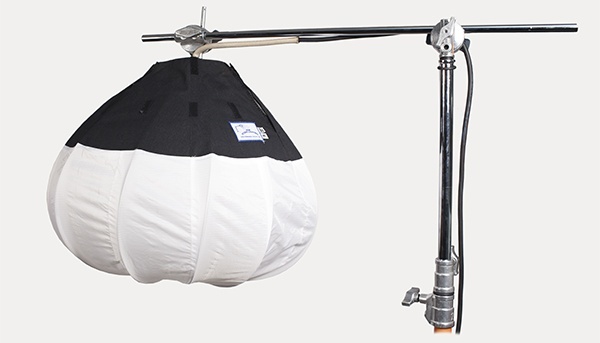 Dedolites are compact units that use a unique lens system to produce very focussed, controllable light from (most commonly) 150W bulbs. They are widely available to hire, come with in-line dimmers, and are small and light enough to be rigged overhead or in tight spots. I often use them to beef up practicals. Source Fours or (a.k.a. ‘lekos’) are ellipsoid reflector spotlights. 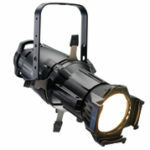 They feature cutters which can be used to shape the beam, they can be hired with different lenses (some of which are zoomable), and they can be fitted with gobos to project patterns. They are good for stylised pools of light or for firing into distant bounce boards without spilling light elsewhere. 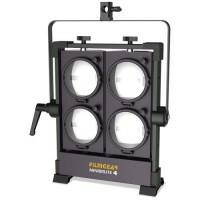 Spacelights are wagon-wheel configurations of three or six 1K lamps inside a cylinder of diffusion material. 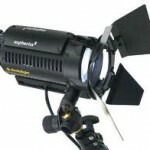 They are normally used in large numbers to provide ambient toplight on stage. 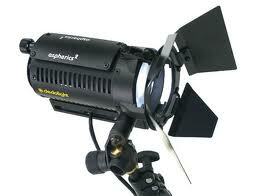 Click here for a brief video introduction to spacelights. Jem Balls, or China balls, resemble Chinese paper lanterns. 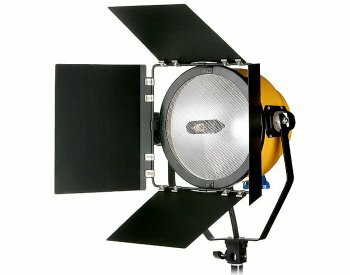 They come in 22″ (up to 1KW) and 30″ (up to 2KW) sizes and produce a very soft light which I personally find is never bright enough. 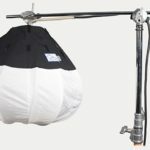 Bare bulbs (usually referred to as ‘globes‘) in pendant fittings can be hung from overhead or hidden behind set dressing, perhaps to beef up practicals. On Ren: The Girl with the Mark and other projects I hid some globes behind furniture to enhance the pool of light from candles. 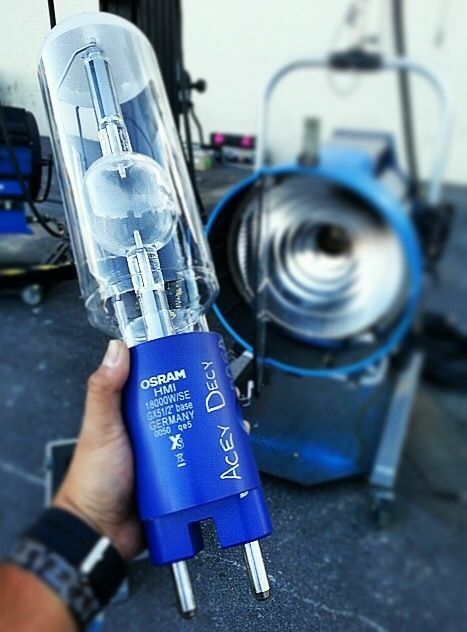 Finally, tungsten is usually the most desirable type of bulb to use in practicals. It is commonplace when shooting a daylight interior for a spark to go around replacing the energy-saver fluorescent bulbs in the table lamps with old-school tungsten ones. The colour is much nicer, the skin tones are better as noted above, and they can be dimmed to just the right level for camera. I’m sure I’ve missed something out – please feel free to let me know on Facebook or Twitter! Next week: HMIs.